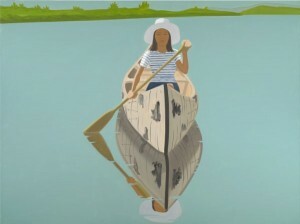 Two solo shows of celebrated American painter Alex Katz are opening, giving museum-goers the opportunity to see six decades of work. 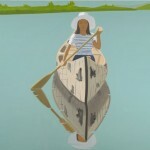 Alex Katz, Good Afternoon, 1974, oil on canvas, 72 x 96 inches. 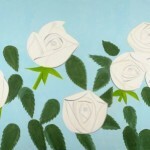 Alex Katz, White Roses 9, 2012, oil on linen, 108 x 216 inches. 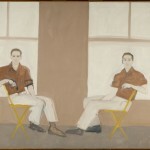 Alex Katz, Double Portrait of Robert Rauschenberg, 1959, oil on canvas, 66 x 85 1⁄2 inches. 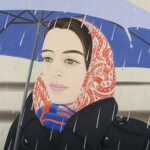 In a release, Michael Rooks, Wieland Family curator of modern and contemporary art at the High Museum of Art in Atlanta, was quoted as saying, “Today, at the age of 87, [Alex] Katz seems as young as any emerging artist. He paints with gutsiness and a personal resolve that has driven his practice for six decades, but which has become increasingly accelerated in recent years, reflecting a uniquely American boldness and steadfastness of purpose.” When discussing Katz, who has two major museum exhibitions opening this season—at the High and also at the Colby College Museum of Art in Waterville, Me.—it seems difficult to avoid the subject of age. This is not necessarily because it is unfathomable that an artist could be so active as an octogenarian but more because of the “boldness and steadfastness” Rooks mentions. Katz is one of the last surviving emissaries of the postwar avant-garde, having known and shown with many of the most memorable and forgettable artists of the second half of the 20th century. The artist, who has been the subject of over 200 solo exhibitions and some 500 group shows since 1951, has been present in the art world and the visual culture of America for a very long time. On more than one occasion Katz has described the goal of his work as being linked to the notion of “quick things passing.” (In fact, the critic Carter Ratcliff, a frequent contributor to this magazine, published an essay of this title in 2012, for a catalogue accompanying a show he curated at Colby College). 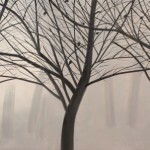 Though certainly not an apt description of Katz’s career, the phrase refers to the capturing of fleeting moments, as in 10:30 AM, a 2008 painting that depicts the midmorning light hanging among a group of trees. Another great American landscapist, Charles Burchfield, strove in his later work to depict multiple times, weather conditions, or seasons on one canvas. The result was a cacophony of boldly painted organic details that alighted together in the same painting as if they were listing the capricious mood swings of nature. Katz, in comparison, freezes a singular moment, which suspends time while also being highly suggestive of its movement. It is the artistic equivalent of capturing a firefly in a glass jar. 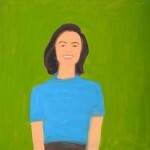 The show at the High Museum, titled “Alex Katz, This is Now” (June 21–September 6) takes in the whole span of Katz’s career with 40 works created between 1954 and 2013. In particular, Katz’s treatment of landscape will be prominently featured, showing how environment evolves from the setting for his human figures to the central focus of his canvases. The exhibition places special emphasis on his recent landscapes, painted since the 1980s, putting 15 on view together for the first time. The series, which Katz calls “environment paintings,” are made on a colossal scale. To look at these paintings is to be engulfed by them. The images depicted are often cropped and lack a horizon line or specific point of spatial reference. Katz strips away extraneous detail, focusing on the essence of form. His powerful brushstrokes capture the play of light and time on his subject matter, attempting to depict the cognitive moment when visual information and the viewer’s experience of it are in harmony. In 1954, inspired in part by the cutout paper constructions of Henri Matisse, Katz began to make collages with pieces of watercolored paper. Wildflowers in a Vase (circa 1954–55), a delicate collage, seems so aligned with Katz’s painting style that from far away it might not read as cut-out paper. It is fitting then that in his essay “Katz Paints A Rock” in the exhibition catalogue for “This is Now” (the High’s show features Katz’s collages), the artist David Salle writes, “[Katz’s] mature paintings are also collages of a sort—obviously not the disparate material mash-ups of Surrealism, or Pop but simple, legible shapes massed together: the Matisse cut-out version of collage.” As Salle notes, themes from Katz’s early work constantly become recycled and refined throughout the years. “It’s so painterly, yet so conceptually rigorous,” says Tuite of this work. “You see him synthesizing the work of a lot of his contemporaries—de Kooning, Color Field, abstract expressionism. We think of him as someone in his own category, but more than ever we see him in the context of being what representational painting was in the ’50s.” Both exhibitions, either by focusing specifically on the ’50s or showing an evolution of work from the ’50s to now, give an in-depth look at how Katz developed his style. Challenging the non-objective, abstract painting of the New York school in the 1950s, Katz created works that concentrated on a central subject—what Ab-Ex painter Barnett Newman called “object matter”—isolated against a monochromatic background or landscape. Katz used Pollock’s framework and applied it to representational painting, while also adapting Color Field as a void-like environmental space, thus creating a confluence of representation and abstraction.